a historic museum at Williamsburg, Virginia in my heart! that I want to convey . (The hearts full of gratitude phrase is available from me directly and exclusively. If you are interested, please email me with a request. to open the download file that will be sent. Here is the finished vinyl on my entryway wall. 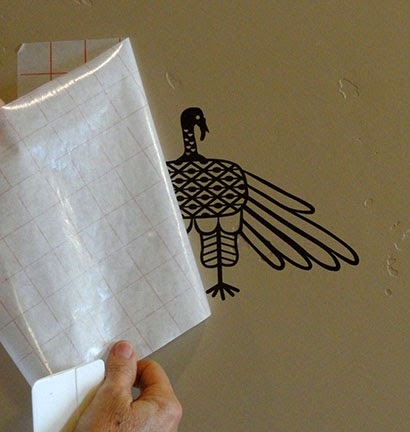 In order to allow this design to be cut on the machine, large or small, the turkey cut file is prepared as two separate sections: body (with wings) and tail. 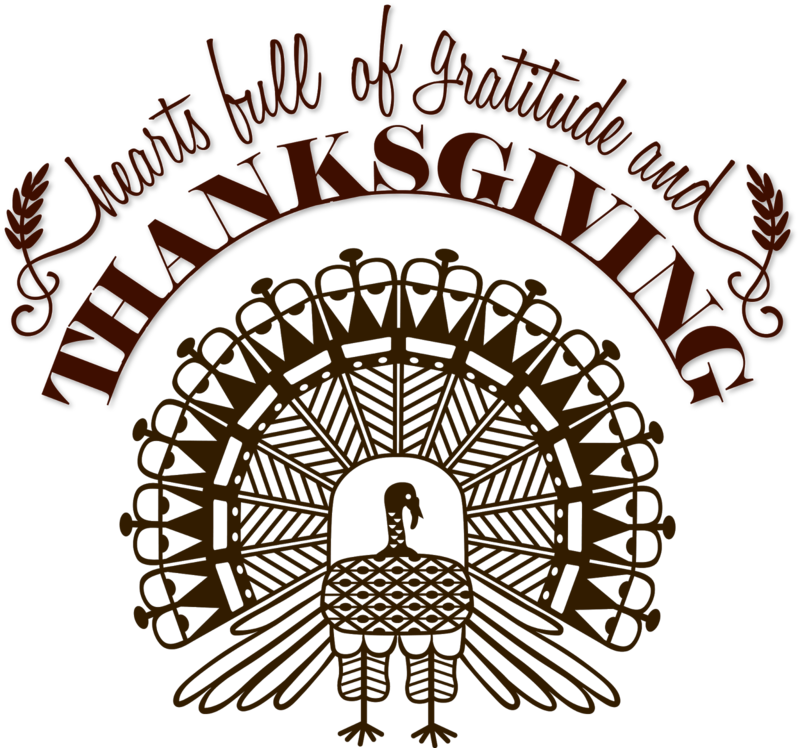 The phrase is also presented in two sections: left upper (hearts full/THANK) and right upper (of gratitude and/SGIVING). This tutorial will demonstrate how these can be re-aligned before or during the steps as application is being made. Step 1. 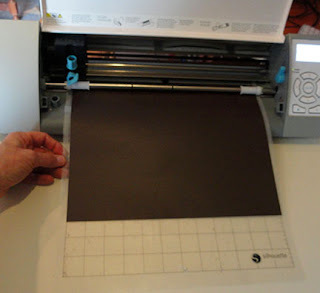 Download, adjust size and settings as you wish, etc., then load the adhesive vinyl into the Cameo or other Silhouette cutting tool and cut. 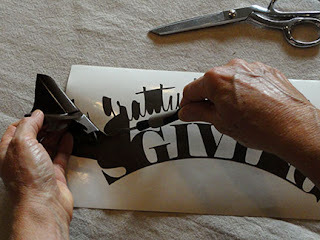 If you are new to vinyl cutting, check out a great Silhouette blog tutorial here. Step 2. Carefully "weed" away the excess vinyl from it's backing sheet using precision tools and scissors. Cutting away waste sections as they are removed helps avoid the problem of having the sticky backing of accidentally grabbing and breaking the fine parts of this design. Complete the weeding for all sections. Step 3. Align the phrase sections after they are weeded. Notice how I have lined up the lower edges of the arch where the 'K' and the 'S' bases meet, while at the same time comparing and matching the spacing between the upper line words "full" and "of". To help this, I have trimming away the excess backing right along the 'S' left lower edge, and through spaces above. This way, I can see how to properly align the sections. Use temporary tape to hold the backing pieces together once aligned. Step 4. Turn over the phrase assembly and tape the backside securely, too. Step 5. 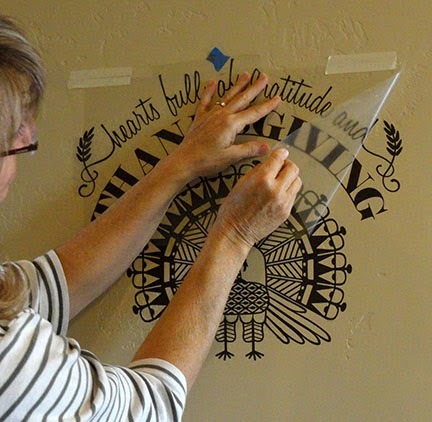 Position and smooth the transfer paper over the joined vinyl phrase and turkey sections. Here I am using some leftover carrier sheet that came with my Stencil Vinyl from Silhouette America. It is wonderful to have a see-thru transfer paper, but regular transfer works just fine, too. I will use regular transfer for the turkey sections. Step 6. 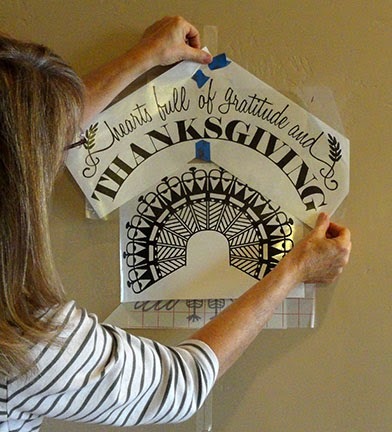 Analyze the wall space you intend to use, find the center mark, and place temp tape with a drawn center line to help with alignment of the parts on the wall. I have taken away the center part so that I can place my turkey and phrase there. What remains is an upper and lower center line. Step 7. Temp tape the sections roughly in their final positions to check that north/south and side-to-side placement is really what you want, then make adjustments to guide tape if necessary. Then remove the top phrase and middle tail sections. Step 8. 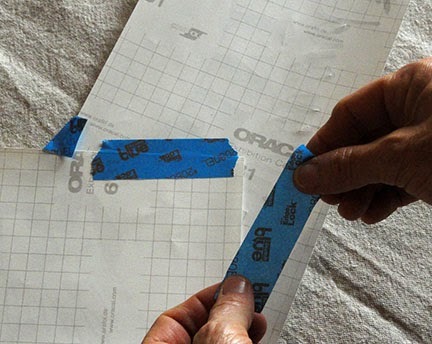 Follow standard procedures to place temp tape "hinge" strips along the top edge of the transfer paper, locking in the positioning previously achieved. 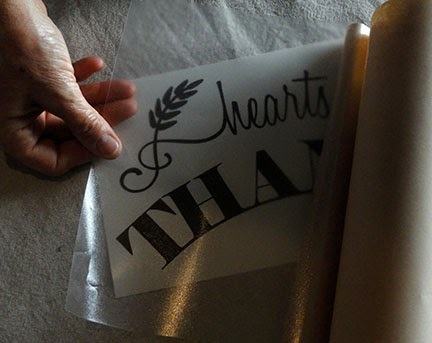 Hinge the layers up and peel off the vinyl's backing sheet, leaving the vinyl on the transfer sheet. 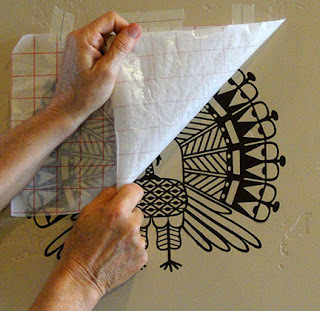 Carefully hinge back down the transfer sheet and smooth against the wall. Use the credit card tool to rub the vinyl to create adhesion to the wall surface. Peel back transfer sheet making sure that the vinyl is attaching correctly. Here the turkey body is being placed. Step 9. Re-align tail feather section on the center line AND adjust up/down until the inner lower "corners" of the inner arch just touch the body edges. Follow the same transferring procedures for this section. Here the tail section has been placed and the transfer sheet peeled off. Step 10. 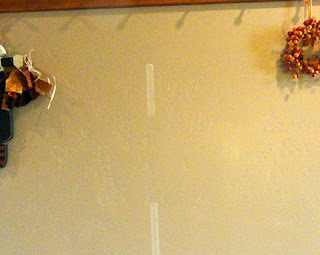 Position, align, tape in place, etc., to position the phrase section. At this point, you may need to remove the upper part of the tape with alignment marks, if it interferes with the area where the phrase will be transferred. Here, the transfer sheet is being removed from the phrase. I love this holiday. 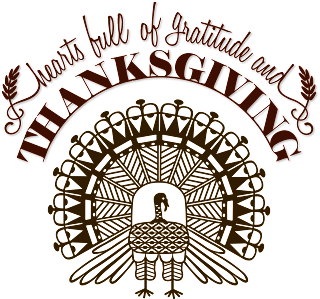 It means so much to me and my family to express gratitude and thanks for our many blessings, before all the "gimmees" of Christmas attempt to take over! 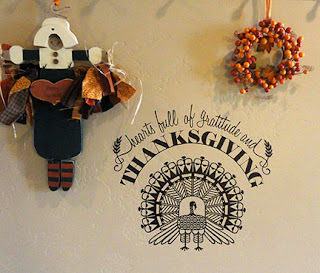 during this season of giving thanks! 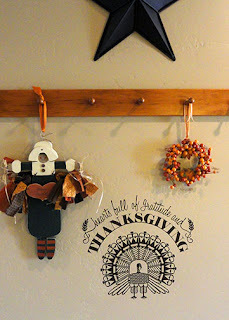 December Docket Quilt Kit Chart - Quilts Etc.